So far living in Helsinki never required me to buy a car or even get a driving license. I have lived always in a near to the center area reachable by public transport but public transport even amazing as it is in Helsinki has its plus and minuses. The lovely service that Helsinki city offers is amazing compared to a country like Lebanon where each one own a car and such basic service as public transport is non-existant! 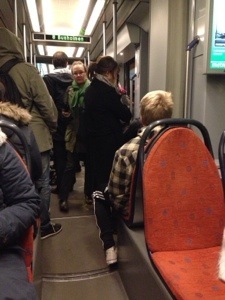 Helsinki public transport though has a curse and it is the behavior of people sometimes in it’s tram’s! Now, no i am not talking about the screaming drunken guy in the back. I have no issue with that he is part of the “city” but i have an issue with you sir or madam taking two seats or more and not moving for an elderly person or for many other reasons listed below. 1- Wait for others to exit before going in and leave space by standing on the side of the doors. 2- Have manners and stand up for older people and give them ur seat. 3- Kindly and i beg you do not stand on the door, please go in take a seat and sit down, relax and chill! Leave kindly the area near the door free for people to move in and out! We are all living like you by the minute! 4- If you think that not buying a ticket will save u those 3 euros then you are so wrong, pay the damn ticket! I hate it as much as you do but until Helsinki offers public transport free like Tallinn you and i got to pay because i dont want to see humiliated by the blue people. 5- When you are in a tram it is not a shame to speak to a stranger or have a conversation. We do take the same ride same time each day for years so you can say Hello sometimes. It is not weired at least in my opinion.